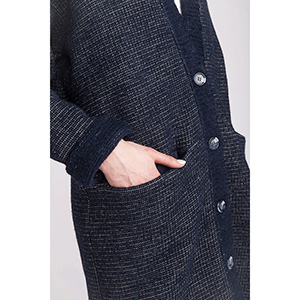 A straight-cut, oversized and loose-fitting cardigan that hits below the knee with dropped shoulders and in-seam pockets at front. There is a band on the front edges and neckline, cuffed sleeves, creating a rolled-up effect, and fastens with five buttons. This is a simple level sewing pattern. 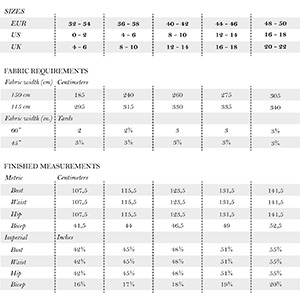 Suggested fabrics are hacci sweater knits. If your fabric is lighter or very stretchy, consider choosing a smaller size than your regular size. Select a medium weight jersey for the pocket bags. Note that the pocket bags can show through the pocket openings, so if you wish, choose a color that matches to your main fabric color.